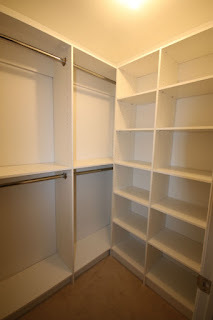 This closet renovation was more for fun than anything... We built out my closet and then stuffed it back up with all my clothes....Check out these empty and full pictures... 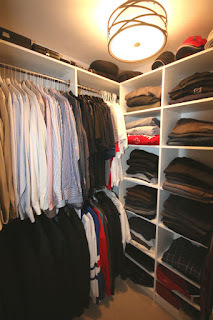 I really need to get another closet or start to purge some more clothes!!! The picture on the left showcases one of our design configurations for leveraging the wasted space typically associated with closet corners (fyi...we have 4 different designs to make better use of a closet corner). In the photo on the right, I have taken advantage of my corner hidden storage space by adding 2 suitcase luggages on the corner hidden shelves (one is located on the top shelf and the other one on the bottom shelf). This design is perfect for those folks who travel often but don't want to see their suitcases when they are not on the road travelling...Clean and simple storage by TCC.